Baby Munchables are the new Organic Rice Teething Wafers brought to you by Nosh, the baby and toddler snack experts. These artisan style rice rusk wafers will turn any frown upside down. With foodie flavors created by our baby food experts and tailored to baby’s sensitive, yet evolving palate, Baby Munchables are sure to tantalize even the smallest taste buds. Munchables are a delicate rice wafer baked to just the right consistency so that it easily dissolves in baby’s mouth. It’s an organic teething wafer that is similar to a baby cracker or biscuit, but with a lighter texture and quick-dissolving. Munchables are the perfect “finger food” baby snack that baby can easily hold on their own and use to soothe their sore gums when they are teething. Baby Munchables can be fed to babies as soon as he or she is ready for solid food – no teeth are required to enjoy! We want you to be completely satisfied with your order. If you have any questions, comments or concerns, please contact us at hello@luv2nosh.com or give us a call at 1-844-NOSHERS and we’ll be happy to help. TEEETHING WAFERS DISSOLVE EASILY: Baby Munchables organic teethers are the quick-dissolving first snacks for teething babies! Designed as a first finger food for baby, the teething wafers dissolve (not crumble like other teething biscuits) in baby’s mouth so there are no messy crumbs to contend with. 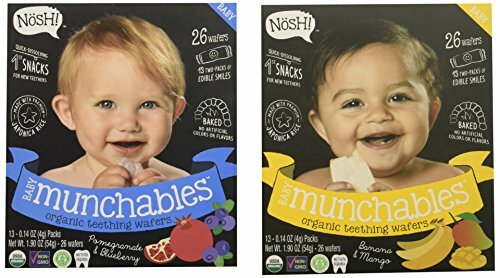 NO TEETH REQUIRED: Munchables Teething Wafers are the baby snack that can be given to baby as soon as he or she is ready for solid food. Teething wafers will dissolve against baby’s gums, helping to soothe them while they’re teething. BABY FOOD WITH ORGANIC, PREMIUM INGREDIENTS: Munchables baby food teethers are USDA Certified Organic, Non-GMO and certified Gluten-Free. All of our baby food is delicately sourced and produced with premium ingredients – never artificial colors or flavors. FREE OF THE 8 COMMON ALLEGERNS: Munchables organic teething wafers do not contain any milk, egg, fish, tree nuts, crustacean shellfish, wheat, peanuts or soybeans. ARTISAN FLAVORS DEVELOPED FOR BABY’S TASTE BUDS: Each flavor combination is hand selected by experts and tailored to the baby palate. We offer a wide range of healthy flavors from fruits and vegetables to expose your child early to healthy eating habits. ALWAYS BAKED: Munchables teething wafers are always expertly baked, never fried. MADE WITH PREMIUM JAPONICA RICE: Rice is something we know oh so well! We collaborated with seasoned bakers with 30 years of experience making rice rusks and rice snacks for babies and toddlers all around the world to bring you our Munchables japonica premium-grade rice teethers. If you have any questions about this product by nosh, contact us by completing and submitting the form below. If you are looking for a specif part number, please include it with your message.